A 2009 survey of senior executives and project managers worldwide found that “80% of survey respondents believe that having project management as a core competency has helped their company to remain competitive during the current economic turndown.”1 Eighty percent. That’s a lot. The project manager’s responsibilities include building a project plan that identifies what must be done by when and by whom. Milestones must be identified and adhered to. Budgets must be closely monitored and scope creep must be kept in check. Risk must be identified with enough time to mitigate and manage any effect it may present. Project status should be communicated to all including stakeholders, those directly affected and even those simply watching from the sidelines. All of this solidifies the confidence in the participants and the project itself, a key element in project acceptance at conclusion. Depending on the size and complexity of the project, failure in any one of these responsibilities can lead to disaster, wasted resources and staggering costs. 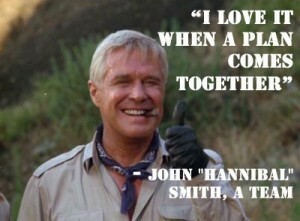 “I love it when a plan comes together.” The words of “Hannibal” Smith, the leader of the A Team in the old TV series still ring true today. While project management plans don’t typically involve explosives, they DO have to be well laid out and meticulously followed to reach a successful conclusion. And even if your plan meets the intended conclusion, is it focused on the right permanent solution? Not always. Let me share an example of a plan hitting its target but exploding in everyone’s face when they realized the impact. A company completed its project to track and report on timed promotional sales results. The sales team that sold the most of a specified product line received financial rewards and a team trip. Companywide results were posted every week. The winning team held back reporting much of their sales until the very last week, when it was impossible for anyone to push back to beat them. The team that won also happened to be one of the largest facilities in the company. The impact was immediate. Several other locations protested the results and any good intentions of fair competition were lost. Needless to say, changes were implemented for the next promotion that included week-over-week results and a percentage of growth-to-revenue measurement by location. The lesson learned – build your Key Performance Indicators (KPIs) to achieve your strategic goals. Some common measurements include ROI, project timeline / budget, affected costs, profit margins, expected impact, quality, and stakeholder / customer satisfaction. Choose a measure that is tied to your business goals. Measurements should be taken before, during, immediately after project completion and even later, to ensure continued success. For more project management guidance, check out our last blog, Project Management: How To Keep Control Of Actual Project Costs And Avoid Scope Creep. 1 Closing the gap: The link between project management excellence and long-term success, Economist Intelligence Unit, October 2009.